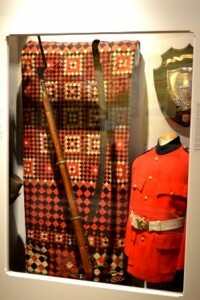 Militia quilts were made from military uniform fabrics of wool serge in regimental colours. They are also called uniform quilts, soldiers’ quilts or Crimean quilts. The majority of them were made between 1850 and 1900 throughout the British Empire.This quilt was donated to the Museum’s collection in 1965 by Mrs. George Dobson of British Columbia. She stated that it was made by a soldier here in Stratford in 1866 during the period of the Fenian Raids. 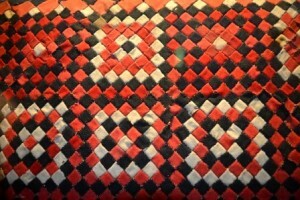 It displays typical characteristics of militia quilts: small, regular geometric shapes, strong regimental colours – reds, blacks, creams and greys – a medallion format radiating from the centre and mosaic piecing of “military precision”. Whip-stitching or flat over-stitching with little if any seam allowance is also a common feature. This militia quilt is currently on display in our Perth UP: A Retrospective of Duty and Valour exhibit. The Yeandle Plough was invented by blacksmith Thomas Yeandle in Stratford and received its patent for “a certain new and useful improvement in mould boards for ploughs,” as noted in the Commissioner of Patents Journal for July 9, 1872. The Reports of Commissioners to the British House of Commons commended Yeandle in its 1877 report for a “useful general purpose plough, well made saving of undue friction by a peculiar construction of underside and mould board; for steel sole of small ground surface; for peculiar form of landside allowing of considerable wear; (and) adjustable steel mould-board of good form.”His blacksmith shop was originally situated behind the present Perth County jail. He later relocated his Yeandle Plough Company to Church Street. 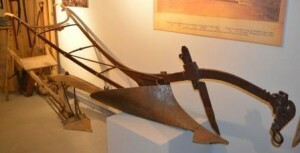 The plough won 1st prize at the Ottawa Provincial Exposition in 1875, and 1st prize at the Philadelphia Exposition in 1876. Our plough was used on the Reid farm near St. Marys. It will be on display in our Can You Dig It? Perth County’s Agricultural Roots exhibit in October 2017.